Despite many sources spreading the false assertion that Studio Ghibli has closed its doors for good, we still don't know what the future holds for Japan's greatest animators. While no film is currently in production at the studio, many of the staff have moved on to other projects elsewhere in the meantime. Among them is former Ghibli producer Yoshiaki Nishimura who is currently working at Studio Ponoc. Nishimura's first Ponoc project to see the light of day is a commercial promoting West Japan Railway Company- and it will look very familiar to Ghibli lovers. At just 15 seconds in length, it's very short, but it's got some beautiful animation that will no doubt remind you of Ghibli's films. Nishimura acted as a producer on the project, while fellow Ghibli veteran Yoshiyuki Momose was the director. 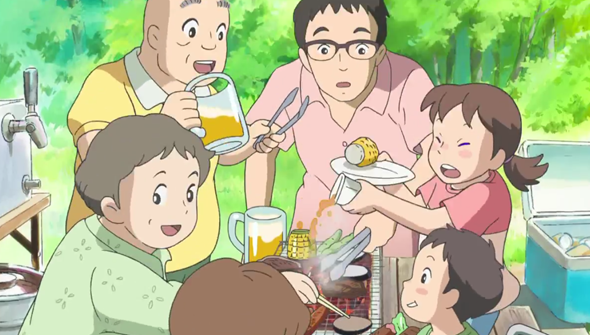 The advert shows a typical Japanese family enjoying the summer together (thanks of course to those wonderful WJRC trains!) and features some beautifully sumptuous Ghibli-esque backgrounds and some distinctly Miyazaki-style character designs. Watch the short below. Daughter: "I wonder if the wales are swimming? Maybe the Dolphins?" Daughter: " Summer is thrilling! Summer family!" Everyone: " JR Summer Train!"